This is my full review of the 2017 TaylorMade M2 iron, a Golf Digest Hot List gold medal winner. 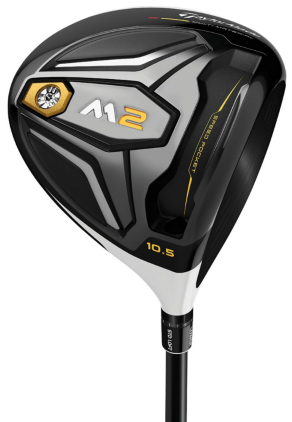 Labeled “distance, height and forgiveness”, the M2 is intended to give the complete performance package with top forgiveness, distance, a high launch and a low center of gravity. It sports several new features and improvements over the 2016 model. The M2 irons have a very positive reception — an average star rating of 4.5/5 on Global Golf, 4.2/5 on the DSG website, and over 4 stars (100 reviews, 80% recommended) on the official TaylorMade website. See the customer ratings on Amazon here. Generally speaking, the irons have also been received well by professional critics. People have lauded the amazing distance results, unparalleled forgiveness and accuracy (large sweet spot), great feel in your hands and at impact, and easy launching of shots in just about every situation. Many people have reported distance gains of 10-15 yards and even more without sacrificing height. On the other hand, many have expressed concerns about the durability of the irons. Many users have reported caving in and failure of the Face Slots and other parts of the clubface, which then need to be replaced by TaylorMade. Other negatives lie with limited touch and shotmaking capabilities, as well as the overly-bulky look of the iron at address. 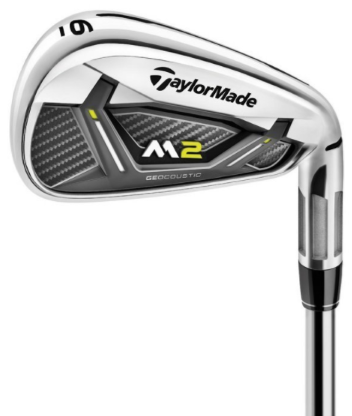 According to TaylorMade, the M2 is their most technologically-advanced distance iron. Each technology listed below works together to produce more distance, a higher launch angle with less spin, better forgiveness, and improved overall consistency with every swing. Low CG: A new thinner, wider, six-sided Fluted Hosel saves 5 grams of weight (compared to 3 grams in the original M2 iron), allowing for the repositioning of 2 grams of discretionary weight lower in the clubhead, thereby lowering the center of gravity (CG). A low CG in the M2 irons produces higher launch angles. The new hosel bend slot also allows for a 30% improvement in bending. Face Slots: These are slits on either side of the hitting area on the clubface (one towards the heel, one towards the toe) that are designed to increase flexibility and ball speeds on either side of the sweet spot. Speed Pocket: Similar to the Face Slots, the thin-wall Speed Pocket is a slot at the bottom of the sole designed to increase flexibility, ball speed and forgiveness on shots hit low on the clubface. Geocoustic Technology: Similar to the M2 metalwoods, the M2 irons implement TaylorMade’s Geocoustic engineering: acoustics tuned through geometry to create ideal frequencies for pleasant sound and feel. Shafts and Customization: Available stock shafts are the Reax HL 88 by FST (S, R) in steel and the M2 Reax (75g-45g / S, R, A, L) in graphite. Many additional custom shaft options are also available. The stock grip is the TM Dual Feel .600 Ribbed 47g. Below are the specs of the M2 irons. Click or zoom to enlarge. How do these irons perform? In comparison to the 2016 model of the M2, I found the overall performance to be similar but a little bit better. Distance/Distance Control: Arguably the greatest strength of the M2. Absolutely smashes the ball. The M2 ranks up there with some of Callaway and others’ longest irons, perhaps even longer. 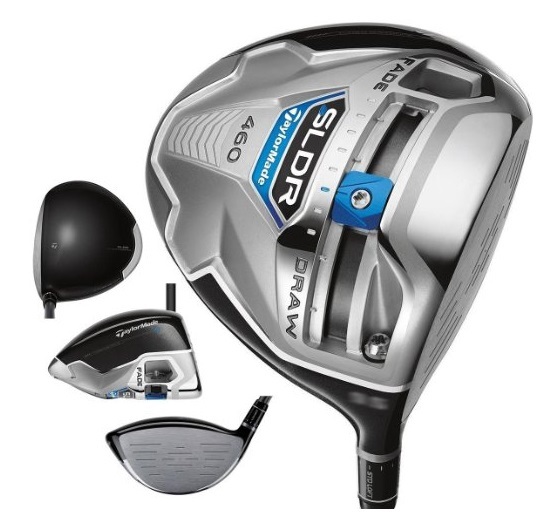 This is due to the low CG in combination with the Face Slots and Speed Pocket which, together, increase ball speeds across the entire face (effectively increasing the size of the sweet spot) and increase the launch angle while keeping spin low. As you probably know, a high launch and low spin is the key to distance, and the M2 provides it. I’ve learned that TaylorMade has some of the best equipment out there when it comes to distance. Distance control is also great; consistent hits produce consistent results, and shots typically have no trouble holding greens. Forgiveness: With the M2’s super distance also comes super forgiveness. As I mentioned, TaylorMade’s various features and technologies built into the iron work to minimize ball speed loss when you make contact away from the sweet spot. Also, because the M2 isn’t really conducive to shot shaping, it has high directional forgiveness as well. The end result are mis-hits that don’t lose that much yardage and don’t go too far off the intended line either. During my testing, the M2 delivered the shot forgiveness I was expecting and more. Very pleased. Ball Flight/Playability: Balls struck with the M2 irons tend to fly high and straight, which is a consequence of the low CG and high-forgiveness design. This also means that those looking for precision touch and robust workability should probably look into other options unless they’re content with manufacturing a baby draw at most. Playability is top; any weekend hack can get the ball up in the air out of a variety of lies with these irons. The beefy, powerful head can cut through the rough no problem. These are some of the easiest irons to hit. Look: In contrast to the M1 which has a more compact look, the M2 has a thicker, bulkier look. A rounded head with a large clubface, fairly thick top line, and wide sole scream game-improvement. There’s also a fair amount of offset which helps with squaring the clubface and getting the ball up in the air with the long irons. It’s a look that should definitely inspire confidence in those who aren’t too confident they can hit the ball solidly. As for the aesthetics, there’s quite a bit going on: some branding, labeling, a classy polished chrome finish, and a white/yellow/gray colour scheme that I think will appeal to a lot of players. Sound and Feel: I found that the M2 irons felt great in my hands, through the swing and at impact. It’s worth noting that the lightness and stability of the Reax HL 88 steel shaft suits the profile of the irons well. There are support bars behind the face and extra adhesive in the cavity that make the sound and feel of the M2 irons better than last year’s version. The feel at impact can be described as mellow yet explosive and very satisfying. Feedback is great. Where should I buy these irons online? At this time, I would discourage you from buying on Amazon, partly because you can get the same prices elsewhere, and partly because many Amazon customers appear to be having problems where they order a set of irons and only end up getting one individual iron. I would strongly recommend checking the current prices on this Global Golf page (free shipping and 30-day return policy). eBay is a fantastic source for new and used sets — look through the discounts by clicking this special link. Best suited for: High-handicappers or anybody who want a very forgiving iron that’s easy to hit, hits long, high and straight. Best places to buy online: See the links above and below. The TaylorMade 2017 M2 irons are best friends to weekend hackers, high-handicaps, mid-handicaps and even more skilled golfers who just want a modern, long, forgiving iron that imparts a nice straight ball flight. 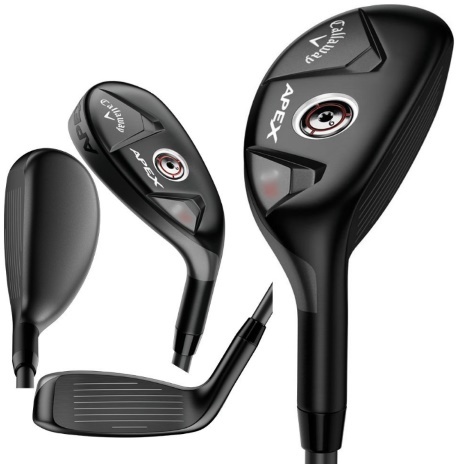 I daresay they overdeliver on what you would expect from a game-improvement iron. They are among the best GI irons currently on the market. If you have any thoughts or questions about TaylorMade’s 2017 M2 irons, leave a comment below and I’ll get back to you!